Hailing from the verdant land of Bend, Oregon comes the funky pop reggae magic of Keez and his latest, masterfully produced record, Water Creatures. Keez, also known as Brad Jones, is well versed in the music industry having already spent years producing, writing and touring. 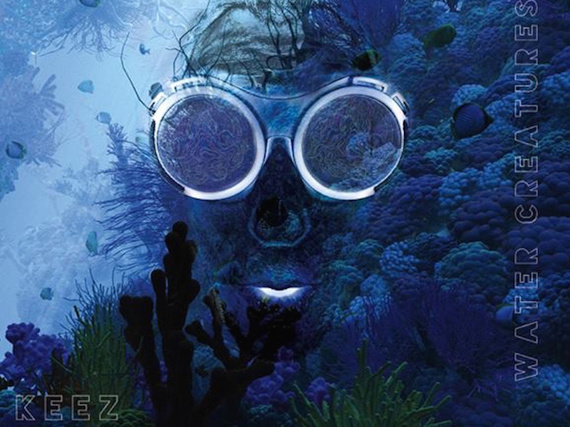 Though Water Creatures is gaining exposure for Keez as a new artist, he is definitely a seasoned member of the music industry. Constantly blending and shifting between genres, Keez produces and performs reggae, funk, pop, rock, electronic and alternative music. He produces daily from his studio in Bend and has not only written and produced all of his own albums but has also worked with many other amazing artists around the world. The success of Water Creatures which was released on October 1st, 2015, has inspired him to grow and evolve as his latest project has been developing The Keez Band who are preparing to go on tour within the next few months. The Keez Band also hopes to perform live at the official CD release party which is currently being planned for December at a local venue in Bend. In his earlier years between 1996 and 2001, Jones played in a well known local band called Floor Ride, performing keyboards, lead vocals and writing. At the bands peak, they were voted Central Oregon's top band three years in a row with Jones being awarded top musician twice. Simultaneously, he kept his sonic plate full as he also played keys and sang for Wookiefoot with his friend Matt Miller who is better known as Matisyahu and Mark Murphy whose moniker is The Whiz Kid. Every spare moment he had was spent raising his daughter and producing his first solo album Spots of Orange which was released in 1999. As time passed, his work in the music industry waxed and waned but never disappeared. He eventually began working closely with his old friend Dave "Dirtball" Alexander producing tracks for both him and The Kottonmouth Kings. His close professional and personal relationship with Alexander gave him the opportunity to go on tour a few times, giving him a glimpse of the quintessential rock star paradigm. A track that Keez produced in 2014 with local Bend artist, JayTablet called "Do My Thang" was featured in the trailer for The Neighbors and soon after he also produced a track for the Ant-Man movie trailer gaining him his first taste of commercial success. His popularity spread, especially in his hometown, which led him to completing his most accomplished creation to date, Water Creatures. The album morphs through various personalities, from the staccato rhythms of reggae to moments of electronic dance music with flavors of funk, pop, indie rock, and more. Full of mellow and uplifting songs that are new, yet familiar, he has produced a genre-bending collection of tracks that have the mass appeal of mainstream music with the intimate charm of indie music. A constant over-achiever, Keez perpetually works on music not for monetary gain but rather because it is second nature to him. He spends every day producing music and focusing on the next step of his sonic journey. Perfecting The Keez Band is currently his main priority but he has already started working on his next album having completed a few tracks. No matter where he is or what life throws at him, Keez will without a doubt eternally be creating music.